Danny Keaton is a comedian from Fort Worth, Texas, who now lives in Los Angeles and tours comedy clubs nationwide. Starting out in Dallas comedy clubs, New Orleans, and Austin, Danny Keaton continues to bring his own distinctive style to the many stages of comedy across the country. From his military anecdotes to his comedic attacks on religion and conservatism, Danny’s humor jabs directly at the many ironies of society’s structure. His comedy takes on American pop-culture, mainstream media, and view more..
Danny Keaton is a comedian from Fort Worth, Texas, who now lives in Los Angeles and tours comedy clubs nationwide. Starting out in Dallas comedy clubs, New Orleans, and Austin, Danny Keaton continues to bring his own distinctive style to the many stages of comedy across the country. From his military anecdotes to his comedic attacks on religion and conservatism, Danny’s humor jabs directly at the many ironies of society’s structure. His comedy takes on American pop-culture, mainstream media, and reality TV. He talks about online dating and even delivers personal tips on cougar-dating! Current highlights include opening for Tommy Chong, appearing with Danny Bonaduce, and earning Canada’s Comic Video of the Month from Yuk-Yuk’s International Stand Up Comedy Clubs http://blog.yukyuks.com/2013/04/comic-video-of-the-month-w-danny-keaton/ . 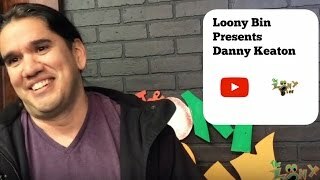 Danny is becoming a regular at The Comedy Store in Hollywood and recently has added acting to his career with roles from reality TV to feature films.